NSSA – NSSA is Crazy for John’s Crazy Socks! NSSA had some special visitors on April 8. 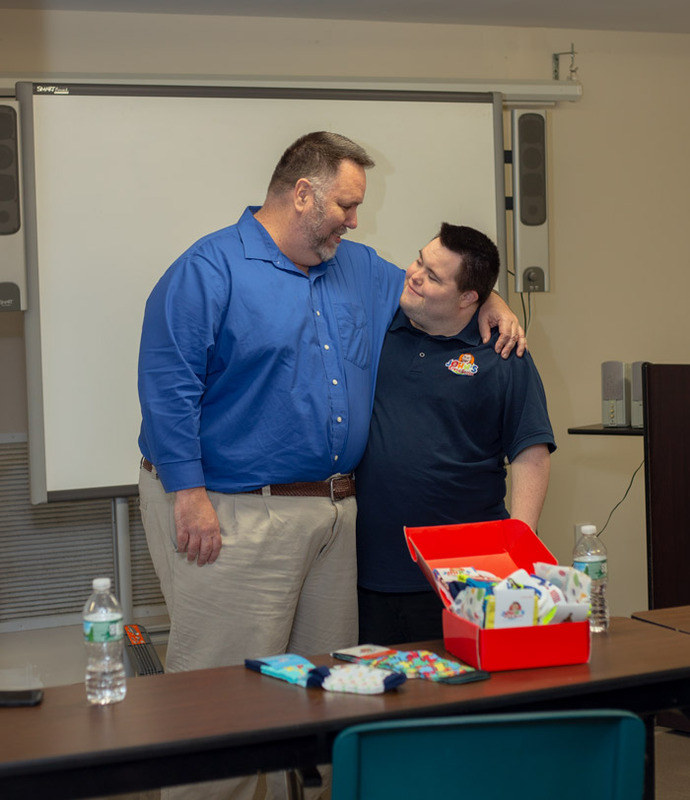 John Lee Cronin, a 23-year-old man with Down syndrome, and his father, Mark Cronin, came to speak to NSSA teachers, direct support professionals and staff about their successful business, John’s Crazy Socks. The business was born out of John’s love for crazy socks combined with his love of making people smile. Their mission was clear: they want to spread happiness. 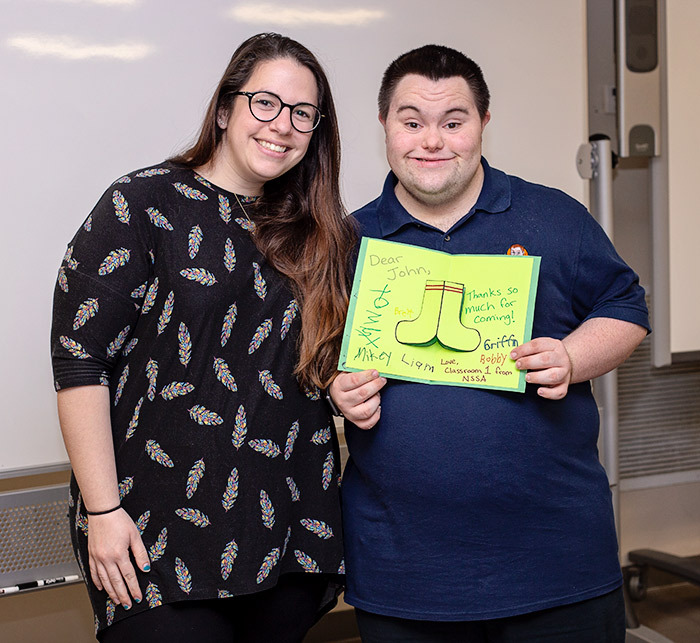 John’s Crazy Socks is a social enterprise with both a social mission and a business mission. The company currently has 39 employees, 23 of whom have a differing ability. John wants to show the world what these individuals are capable of doing. Since the founding of John’s Crazy Socks in fall of 2016, John and his team have built a $5million-dollar sock empire. 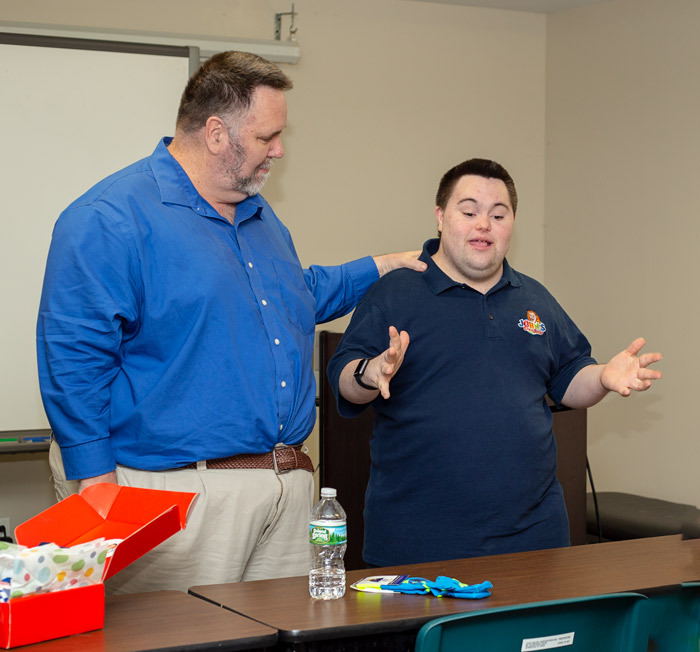 They give back by donating five percent of their earnings to the Special Olympics and raise money through sales of awareness socks (like Down syndrome and autism awareness) that they donate to their charity partners such as Autism Speaks and The National Down Syndrome Society. Through sock sales they have raised almost $300,000 for their charity partners! They combine their social mission with a commitment to be a great sock store. They carry socks with a wide array of fun, unique designs that let customers express their passion and personality. Socks are delivered with fast, personal service, providing same-day shipping, a hand-written thank you note from John, coupons for future orders and candy in every package. 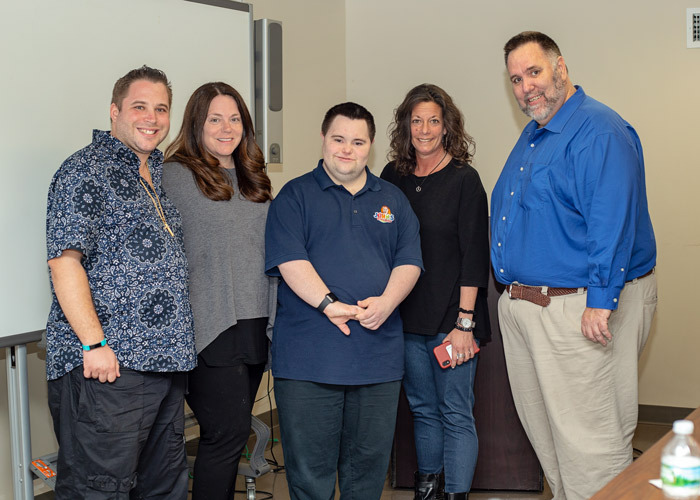 NSSA has begun several social enterprises, as well: the NSSA Salad Shoppe, the NSSA Café, and the newly created bracelet enterprise, so John and Mark had our full attention as they spoke about their experiences. They talked about showing what is possible when you give a person a chance, citing several examples of “happy ending” hires, all ending with the phrase “We did nothing.” But they did do something. They gave a person a chance. And that can make all the difference in a person’s life. For more information about John’s Crazy Socks, visit their webpage, Facebook page, Instagram account or YouTube channel. You can also contact them at 631-760-5625 or by email at service@johnscrazysocks.com.